As a product development partner to the world’s major automotive manufacturers and suppliers, we create early concepts, develop robust designs, provide virtual and physical verification, and refine vehicles for production. 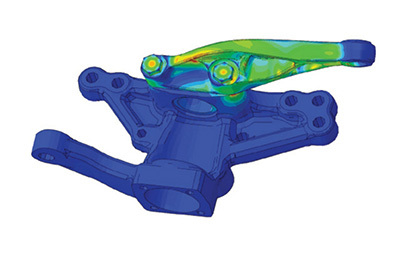 "By utilizing an MDO approach, the new design solution for the castings successfully increased the crash and NVH performance but at no change to the weight of the initial design of the component which did not meet performance requirements by a significant margin." Automakers follow a multipronged approach in achieving fuel efficiency: from engineering lighter structures to the adoption of new powertrain technology and increased emphasis on aerodynamics. Vehicles today are multi-material utilizing more complex materials like high-strength steels, aluminum, magnesium and carbon composites. Altair's Optistruct is an industry proven solution for structural design and optimization and helps designers and engineers to develop lightweight, structurally efficient, and innovative vehicles reducing weight and material costs while managing performance requirements. Altair's NVH, fluid flow and vehicle dynamics solutions drive physical prototype development by directly simulating the end customer experience dramatically improving vehicle performance and comfort. Exterior and internal fluid flow studies with Altair Acusolve provide insight on aerodynamics, cooling, noise, and comfort. Safety remains an essential component in today's vehicle offerings, with pre-crash technologies (active safety) in particular gaining more focus lately. A growing number of OEMs are able to produce vehicles with good safety records. New consumer protection protocols keep challenging the status quo in term of passive safety performance pushing increasingly tougher requirements and advocating the importance of vehicle safety in all markets. Altair RADIOSS as an industry standard in automotive crash and impact analysis is the tool of choice in the hands of crash engineers to satisfy such new challenges.